CIB No. 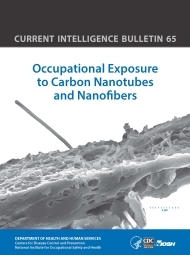 65 " provides model recommendations that will support the safe growth of nanotechnology as scientists continue complex research to fully understand its occupational safety and health implications. In this way, we advance beyond the 20thCentury practice of introducing new materials into the workplace and only later, as an afterthought, considering questions of worker risk. " [... ] Occupational exposure to CNTs and CNFs can occur not only in the process of manufacturing them, but also at the point of incorporating these materials into other products and applications. A number of research studies with rodents have shown adverse lung effects at relatively low-mass doses of CNT and CNF, including pulmonary inflammation and rapidly developing, persistent fibrosis. Although it is not known whether similar adverse health effects occur in humans after exposure to CNT and CNF, the results from animal research studies indicate the need to minimize worker exposure.